The music festival of nomadic nations Nomad Way will be held from in Astana from 11 to 15 June, Tengrinews.kz reports. "This is a five-day event in the territory of the ethnic and cultural complex EthnoAul in Astana, with a low-key but significant name - Nomad Way where representatives of nomadic culture will perform. 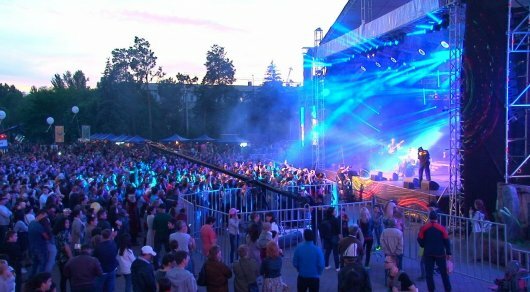 The festival welcomes about 20 bands from different regions, from the Altai and to the Balkans "- said the general producer of radio stations" Zhyldyz FM "and" Tengri FM "Zhan Kasteev. In total, 22 music bands from different countries of the Silk Road will take part in the music festival of nomadic culture Nomad Way: DJ Nariman Issenov (Kazakhstan); "Tigrahaud" (Kazakhstan); "Aldaspan" (Kazakhstan); "Abbos" (Uzbekistan); "Argymak" (Bashkortostan); Tilla Torok's Band (Hungary); Talgat Khassenov (Tatarstan); “Namgar” (Buryatia); “Magic of Nomads” (Kazakhstan); Shono (Buryatia); “Zaman” (Bashkortostan); “Nordic Namgar” (Norway / Buryatia); Gulzada (Kyrgyzstan); “Avesto” (Tajikistan); Chyltys Tannagasheva (Gornaya Shoriya); B. Bairyshev and A.Tchichakov (Altai); Edil Khussainov and Satzhan Project (Kazakhstan); "Ayarkhaan" (Yakutia); Radik Tyulyush and the Chalama (Tuva); Baba Zula (Turkey). "The festival will be held with the support of the Ministry of Culture of the Republic of Kazakhstan, the concerts will begin at 17.00, every day from June 11 to 15. It is gratifying that not only residents of the capital, but also visitors of EXPO-2017 will be able to enjoy the music of nomadic people. This is not the final event. There are three summer months ahead when the residents and guests of the capital can expect many different music surprises, "- Zhan Kasteev added. On May 20 and 21, the fifth, anniversary festival of ethnic culture The Spirit of Tengri was held under the sky of Almaty. Under its roof the festival united hundreds of ethnic music bands from more than 30 countries and regions of the world. The Spirit of Tengri is a multicultural project aimed at demonstrating the ethnic traditions of the countries around the world on the Kazakh land. The project was stablished by the national radio station Tengri FM. General partner of the festival is Kaspi.kz.